Kasma took this picture of a monk kneeling in front of the altar at Wat Phra Phuttasaiyaht Tham Phu Kao in Sahatkhan, Kalasin, Thailand. It’s hardly possible to travel in Thailand without coming across Buddhist monks. 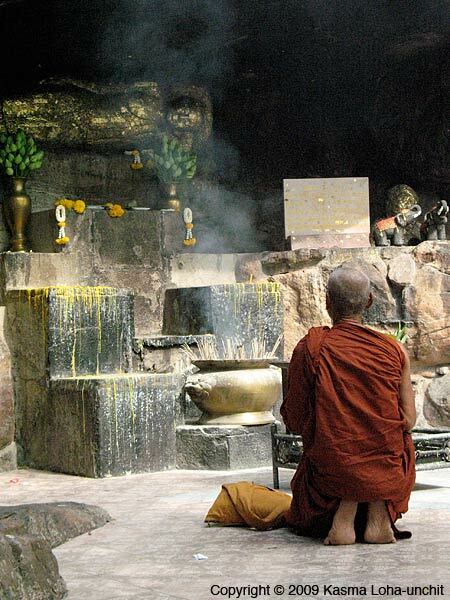 Monks are universally revered as representatives of the Buddha; it is the robes and “The One Who Knows” that is being revered, not the individual self dressed in the robes. 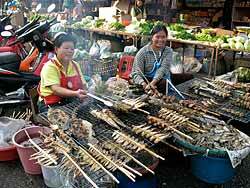 Thai street food is definitely one of the highlights of a trip to Thailand. Every winter for the past sixteen years, I have been taking small groups of Americans traveling around my homeland. A tour guide I am not, but a friend in food I am, and we literally feast our way around the country. There are only so many times one can visit historical parks, museums and temples before losing interest, but I never tire of taking people on market walks and introducing them to the exceptional delicacies that are only available from street and market stalls. On one trip comprised mainly of foodies, every time we made a stop, whether to visit an art gallery or a temple, a number of people in the group quickly disappeared as soon as they got out of the van. I know where to round them up, as they would invariably be found among street stalls, either watching food being cooked or sampling food. You’d think that I don’t feed them enough, but that’s in addition to the three big meals and countless snacks I provide every day. Some of them weren’t even very discrete, causing me worries of them getting sick. But courage they had and plenty of trust in the local herbal pills to overcome stomach problems. 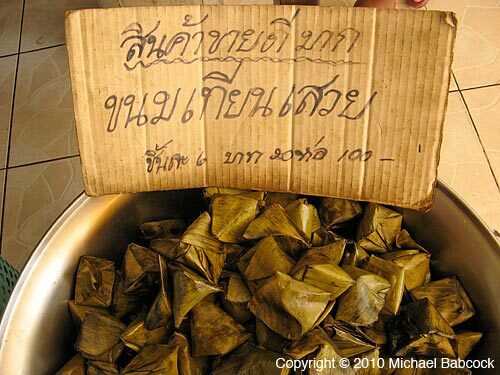 Because of the Thai penchant to please, many western tourists miss out on the finest of the country’s cuisine when they limit their food intake to restaurants. 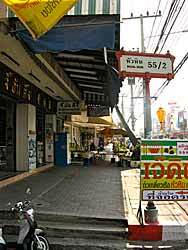 Establishments frequented by tourists automatically water down the Thai dishes served to fair-skinned Caucasians. 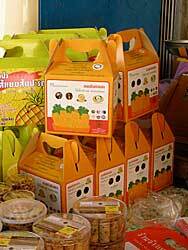 Enough of them through the years have demonstrated that they cannot take the full range of exciting flavors Thais enjoy. Many restaurants translate only those dishes on their menus that they think foreigners like – those sweet, rich foods with little spice. Without a good command of the language to communicate your desires, you can assure yourself of getting real Thai food by dining off the streets, where you are, more frequently than not, treated like everyone else. In the huge metropolis of Bangkok where traffic is horrendous, most working Thais have little time to cook. They purchase ready-made food from sidewalk vendors on their way to work and on their way home from work. 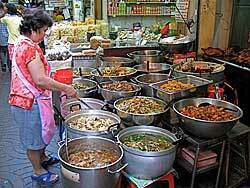 Many of these sidewalk operations offer a wide selection of curries, soups, salads and desserts in huge pots and trays. From them, you may be able to get some fine, home-cooked food untempered for tourists. 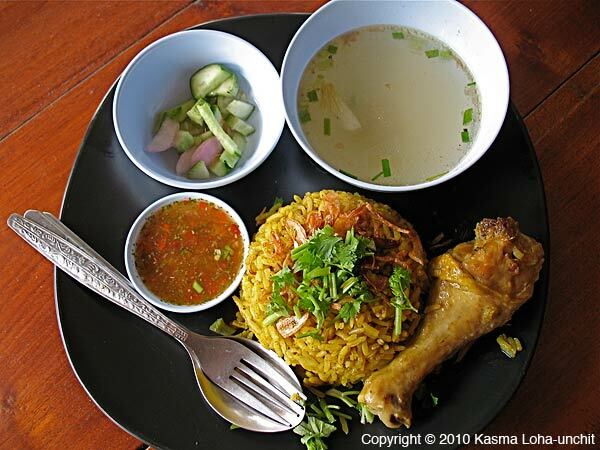 Note from Michael: Although many westerners claim the best food in Thailand is street food and although you can get fantastic food on the street, Kasma does maintain that the very best Thai food is to be had in excellent restaurants, if you know how to order. 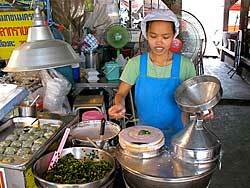 Two of our particular favorites are Reun Mai (in Krabi) and My Choice (in Bangkok). However, as Kasma mentions, there are some foods found almost exclusively at street food (such as the chive dumplings in the second picture, above). Check out information on Kasma’s trips to Thailand. Written by Kasma Loha-unchit, September 2010. One of my favorite dishes in the south is Kao Moek Gkai (Muslim Yellow Rice with Chicken and Roasted Spices), which we often enjoy at our favorite Takua Pa restaurant. It’s a rich rice dish, cooked a bit like a risotto and spiced with cardamom, cloves, ginger and chillies, with succulent chicken and all topped with a sweet and sour chilli sauce. 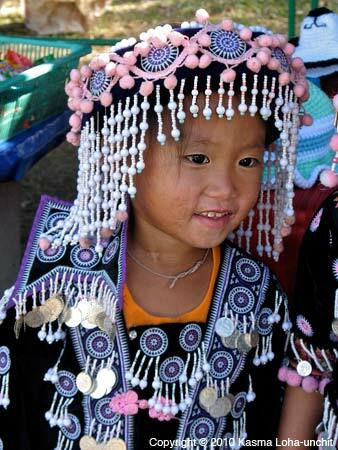 Although it is estimated that Thailand is 90% Buddhist, the south has a much higher proportion of Muslims, who lend a distinct flavor to southern culture, including influencing the cuisine. This picture was taken by Kasma at a bus stop in Mae Sae, near Pai in the northern mountains between Mae Hong Son and Chiang Mai. She says there are a fair number of Muslims in that area and that this is a Muslim dish rather than a southern dish. 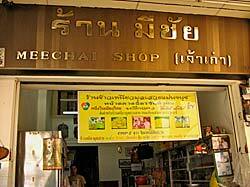 In Hua Hin, Thailand, about 120 km south of Bangkok, there’s a great place to buy snacks. 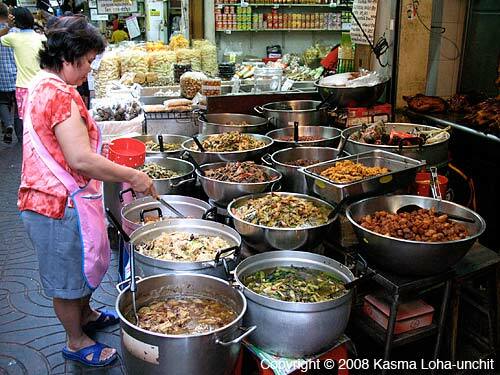 Readers of this blog can be forgiven for thinking that all Kasma and I ever do in Thailand is visit restaurants and markets where we eat all the time. Come to think about it, that’s pretty accurate! Actually, though that’s a bit of an exaggeration, food is never too far from our minds in Thailand, in part because it is so widely available and visible. When we travel around Thailand we rarely miss an opportunity to visit a market and inevitably, over the years, we’ve gotten to know some markets very well. 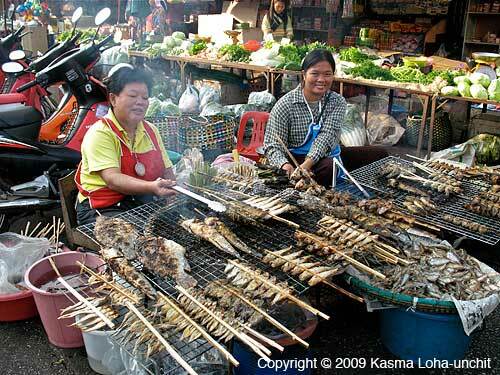 One of our regular markets is Hua Hin Market, for we drive through Hua Hin once or twice a year on our way down South, both on Kasma’s small-group trips to Thailand and when we travel on our own. Another reason we stop in Hua Hin is to pick up Thai kanom (snacks) at one of our favorite snack spots in all Thailand. It’s a storefront called Raan Mee Chai or, in English, “Mee Chai Shop.” It’s found directly opposite the main market in Hua Hin, right on the main road through town. It is just past Soi 55/2 and as you head south it will be on your left hand side. 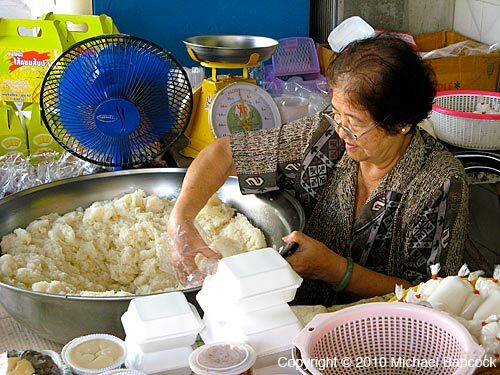 The dough is made from sticky-rice flour while the stuffing contains mung beans and spices, sometimes pork. The dough at MeeChai is particularly gooey and tasty while I’ve never had a filling elsewhere that is so peppery and savory; this one is pork-free. 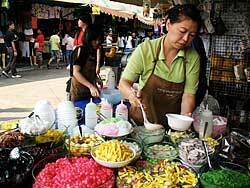 It’s worth a trip to Hua Hin (and this shop) just for this one snack. I’ve pretty much stopped buying kanom tian elsewhere because it always disappoints: it’s never as good as from this shop. Here’s a recipe for Kanom Tian – Stuffed Dough Pyramid Dessert. Although I can’t vouch for how good the recipe is, I’m including it because it has a sequence of pictures that give a very good idea about how the snack is made. The second treat that I like at Mee Chai shop is their Baked Coconut Cream and Taro Custard (Kanom Maw Gkaeng Peuak). 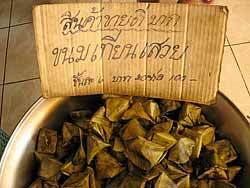 (Another transliteration of the Thai might be Khanom Maw Kaeng.) 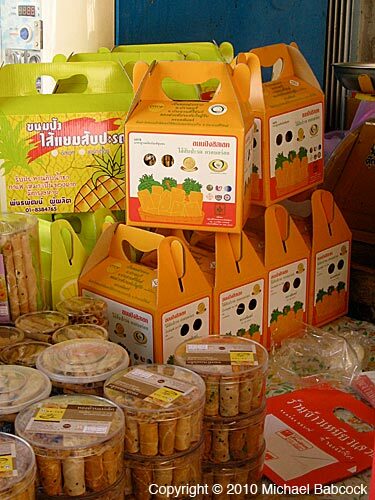 This is actually a snack that another town on the way to Hua Hin – Phetchaburi – is famous for; Thai travelers will make a special stop at Phetchaburi just to buy this custard. They’d be better off going to Hua Hin! I’ve had this snack from several different places in Phetchaburi and I think Kanom Maw Gkaeng here at MeeChai is the best I’ve ever had. 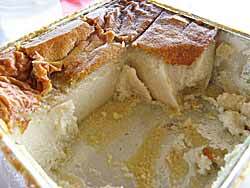 It is an incredibly rich, creamy delicious baked custard. One of the secrets to this delightfully rich custard is that it uses duck eggs rather than chicken eggs. I’ve made it at home using 100% duck eggs and 100% chicken eggs as well a combination of both; by far the best result comes from using 100% duck eggs. 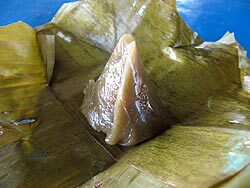 The other ingredients are coconut cream (the thicker the better), palm sugar, and taro that has been cooked and mashed. This dessert is very, very rich. With the Mee Chai version a small square is enough; I eat small bites at a time wanting the delectable smoothness and taste sensation on my tongue to go on and on and on. The shop also sells other treats, other types of custards and also sticky rice and mango. Try anything that looks good to you because it is all good. 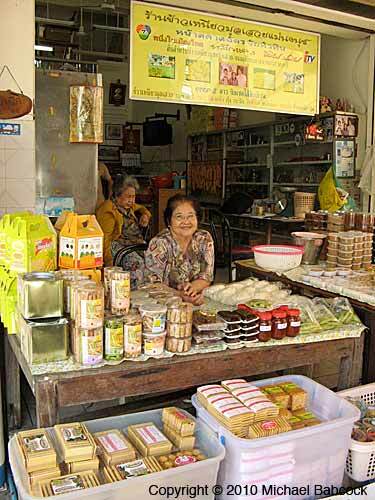 They also sell a number of nahm prik (chilli pastes), nahm jihm (dipping sauces) and gkabpi (shrimp paste), perfect for taking home or as gifts. 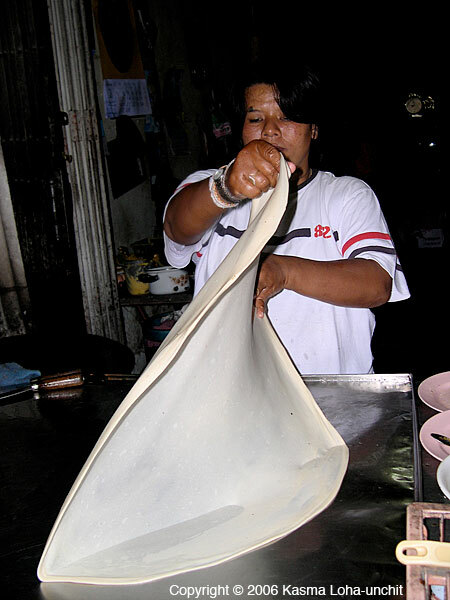 When traveling in the south of Thailand we have two favorite spots for eating roti (Pan-fried Muslim Bread). 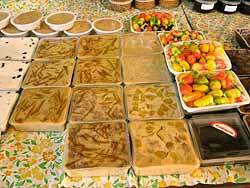 I’ve already blogged about the Thai-Muslim Food Shop in Takua Pa. This picture shows our favorite roti maker in Songkla; she’s got a shop near the night market. She makes the largest roti I’ve ever seen; basically, she just combines uses more dough before she starts spinning the roti out. 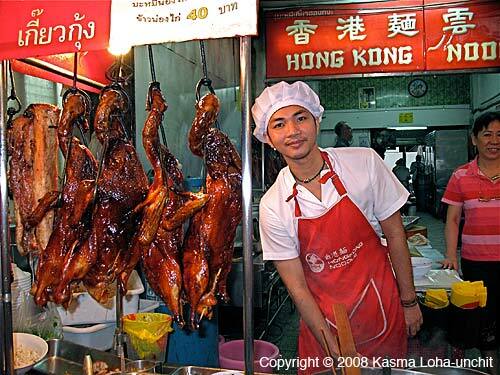 You are currently browsing the Thai Food and Travel Blog blog archives for September, 2010.